Purchase a Milk Bottle Quilt Company gift certificate for your favorite quilter. You simply select an amount from the drop down box and print a certificate for immediate use. 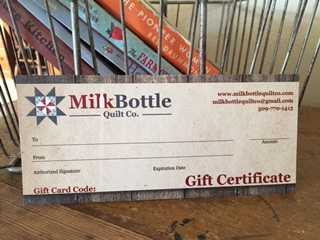 We will also mail you a Milk Bottle Quilt Co. gift certificate as pictured to include in your gift. Redeem your certificate online by clicking the Enter Gift Card link and entering the gift card number.